Sports amenorrhea creeps is often misdiagnosed until almost too late. Sports amenorrhea is not really well known. That does not mean that it is not common; too common actually. It is that sports amenorrhea happens to most women who are not trying to get pregnant, because they are young and don’t mind missing their periods, or because they are heavily involved in endurance sports. Needless to say, when you have amenorrhea of any kind, and it is not what you planned, it is scary and confusing. Time goes on and on and you wonder when you will menstruate again. There is a positively a difference between common anovulatory amenorrhea and sports amenorrhea. First what is amenorrhea? Loosely defined from Wikipedia: Amenorrhoea, amenorrhea, or amenorrhœa, (spelled 3 ways) is the absence of a menstrual period in a woman of reproductive age. It is defined as the absence of menses for three months in a woman with previously normal menstruation or nine months for women with a history of oligomenorrhoea (infrequent or unusually light menstruation). Mayo Clinic states that DHEA has been studied for it effects on menstrual disorders; especially amenorrhea. Dr. Lee studied natural progesterone cream for its use in restoring ovulation after anovulatory cycles. It is not as simple as just jump starting the cycle when it is sports amenorrhea but ovulation must be coaxed along. 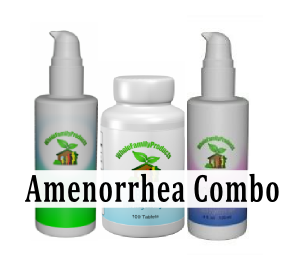 See our combo Sports Amenorrhea kit for more information.